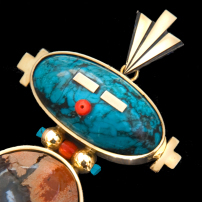 This contemporary, one-of-a-kind piece Zhaawano crafted in the spirit of the late Charles Loloma, the renowned Hopi jeweler who always intended his jewelry to lift the spirit: it should always be highly personal and provide both emotional and artistic stimulus. 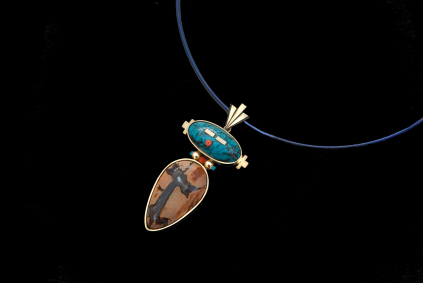 The necklace belongs to the manidoo or "spirit" series, the mysterious expression and internal harmony of its design reflecting the artist's receptiveness to the mysteries that exist in all forms of life: in the earth, the water, and in the sky; and in that unidentified region between earth and sky. 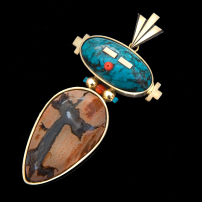 woman, source of all life; the blue color of the turquoise cabochon symbolizing the manidoo's face is for GIIZHIG, or Father Sky. Like all scenes portrayed by Zhaawano, this stylized image of a manidoo, or aadizokaan (grandfather of an-other-than- human class) is infused by his own spirit as well as by the cultural imagery of his ancestors, the Anishinaabeg of the northern woodlands. Yet there were other sources for design inspiration, for instance from the high plateau country of the Southwest: the Corn Maiden and Kat'sina (spirit) imagery of HOPI tradition; the Shalako figures of the ZUNI; and (most of all) the images of Ye'ii, the Sacred Beings of the peoples of Dinetah (the Navajo). Click here to view another necklace from the Manidoo series. They say some spirits live unseen in a sacred realm between earth and sky. Their mysterious existence is visualized in the above necklace in a stylized form with the aid of precious metals and rare stones. Nisawayi'iing awang idash ankwadong mii ji-mikaman gido'ojichaakam. "Between the fog and the clouds you can find your soul." 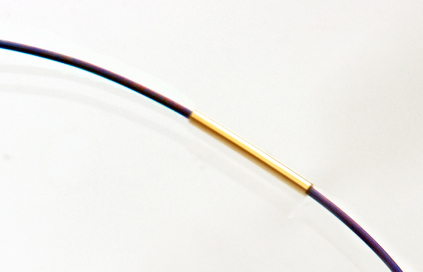 Image: 18K yellow tube fastening of blue-colored titanium collar necklace.